Preparing and evaluating pricing for change orders is an essential project management skill. On the surface, it seems like a simple task. But like most things related to money, appearances can be deceiving. 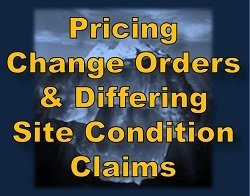 The webinar begins by introducing the many “methods” for pricing changes and differing site conditions. The methods discussed range from basic estimates, to pricing using actual costs, to problematic “total cost” approaches. The webinar concludes with a detailed discussion of how present requests for reimbursement for changes and differing site conditions persuasively. 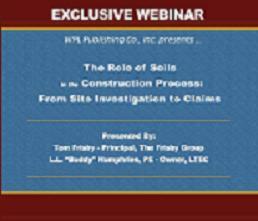 The differing site conditions clause is one of the oldest clauses used in construction contracts, having been created by the federal government in 1926. 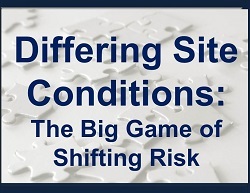 The object of the differing site conditions clause is to transfer the risk of latent site conditions to the owner, thus enticing contractors to reduce contingency at the time of bid. The promise of the clause is that if the contractor encounters a “materially different” condition during the execution of the work, the owner will compensate the contractor for the resulting cost and/or time. For nearly 90 years, this standard clause has been used widely in both public and private contracts. Levees that break, structures that subside, water intrusion, excavation that is impossibly difficult, projects that are delayed, increased construction costs … these can be the legacies of soilconditions which are not properly anticipated or handled. From the top of a mountain that slid into a dam being constructed to the neighbor's basement floor that is heaving after a rain, problems with the soil can be devastatingly expensive to all of the parties to a construction project. One study indicated that more than 40% of cost growth of Federal construction projects was due to differing site conditions and poor or untimely decisions related to them. And not just soils; a variety of represented conditions can trigger a differing site condtions claim. Levees that break, structures that subside, water intrusion, excavation that is impossibly difficult, projects that are delayed, increased construction costs … these can be the legacies of soilconditions which are not properly anticipated or handled. From the top of a mountain that slid into a dam being constructed to the neighbor's basement floor that is heaving after a rain, problems with the soil can be devastatingly expensive to all of the parties to a construction project. One study indicated that more than 40% of cost growth of Federal construction projects was due to differing site conditions and poor or untimely decisions related to them.